DÜSSELDORF — Fortuna Düsseldorf vs Stuttgart – Fortuna Düsseldorf cruised past Stuttgart with a convincing 3-0 victory to move 10 points clear of the relegation play-off position. Goals to Kenan Karaman, Oliver Fink and Benito Raman secured all three points with the hosts far too good for a Stuttgart side that were simply shocking. Düsseldorf established their superiority early on with Dodi Lukebakio taking charge and creating opportunities. It was little surprise when the 21-year-old found space and delivered a delicious cross that Kenan Karaman headed in to open the scoring. Shortly after half-time Jean Zimmer broke free on a fast break and found Oliver Fink who gave Ron-Robert Zieler no chance with a shot that found the top corner. Substitute Benito Raman then raced onto Kevin Stöger’s through ball and produced a composed finish to put the icing on the cake. It was a deserved win for Friedhelm Funkel’s side who controlled the match with central midfielders Fink and Stöger running the show. Lukebakio was the catalyst, going close on a number of occasions and Karaman was good value for his first goal of the season. You would have been forgiven for thinking Kenan Karaman wouldn’t feature regularly for Fortuna during the Rückrunde. Dawid Kownacki was signed to provide competition for strikers Marvin Ducksch and Rouwen Hennings, but it’s Karaman who has stepped up to be the first choice. The 24-year-old had been sparingly used by Funkel but played an important role in three of Fortuna’s four consecutive wins. On the bench in the heavy defeats against Leipzig and Schalke, the 24-year-old returned to the starting line-up against Stuttgart and didn’t disappoint. He was isolated up front in the opening stages, but the striker worked hard and utilised his strength to continually bring his teammates into play. Heading Düsseldorf into the lead, he received a standing ovation when he made way for Hennings late on and could be a sharp improver moving forward. The visitors had some opportunities early on, but Nicolás González and Steven Zuber couldn’t capitalise. From then on it was mostly one-way traffic as Markus Weinzierl’s side looked devoid of ideas and unable to trouble Düsseldorf’s defence. The body language from the visitors was worrying, and there was clear frustration among some players, primarily Alexander Esswein who was raging towards the end of the first half. Tensions boiled over in added time when González was shown a straight red card for appearing to punch Kaan Ayhan in the face. Esswein saw a difficult volley go over the bar but Stuttgart’s only real chances in the second half came from set pieces. 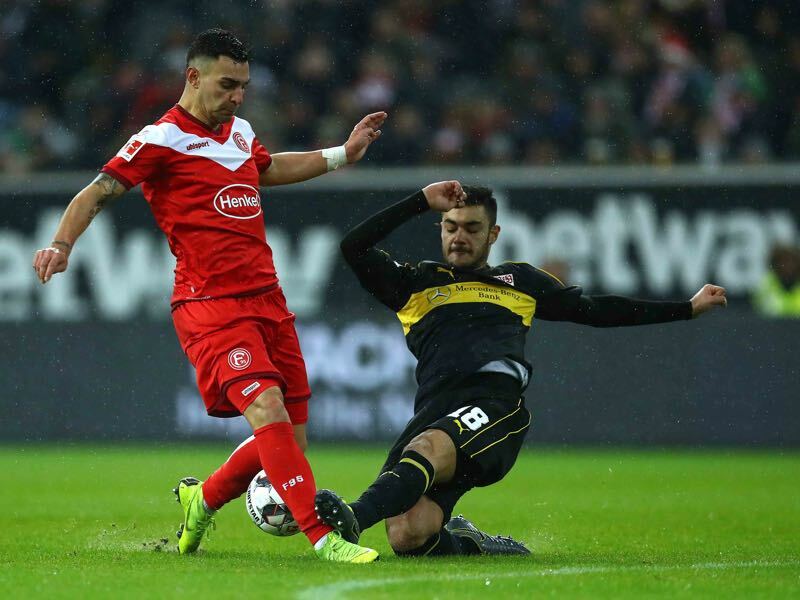 Substitutes Anastasios Donis, Erik Thommy and Chadrac Akolo tried hard and could be involved against RB Leipzig next weekend but personnel is only one of the issues surrounding Stuttgart. The numerous travelling support voiced their displeasure at the players after the final whistle, but their venom was primarily directed at President Wolfgang Dietrich. He and sporting director Michael Reschke have a lot to answer for with Weinzierl only part of a more substantial problem. There were two positives to come out of the defeat for Stuttgart. Daniel Didavi played the full 90 minutes for the first time since October 6, and Ozan Kabak impressed in his third start for the club. The Swabians paid Galatasary €11 million for the 18-year-old central defender in January, and the teenager has been thrown straight into the starting XI. A tough debut in the 4-1 defeat at Bayern München was followed by a better showing in the 2-2 home draw against Freiburg. Kabak showed further improvement here, chasing down and making a crucial tackle on Lukebakio early on and showing impressive anticipation, positioning and passing range for such an inexperienced player. He took a yellow card for the team when stopping Karaman on a fast break. Reschke hasn’t done a great job since he moved into the sporting director role at Stuttgart, but he and his scouting department appear to have got this one spot on. Fortuna Düsseldorf were under no illusions that their recent winning run had them clear of the relegation zone. Defeat against Stuttgart would have undone a lot of the good work in the four-game winning run but these three points were vital. Funkel’s side are now ten points clear of Stuttgart, the season is far from finished, but they have picked up 16 from the last 21 available points. The Swabians have lost nine of their 11 away Bundesliga matches this season and scored just seven goals. Home games against Hannover and Nürnberg aside, it’s near impossible to see Stuttgart winning any matches until the final matchday. It’s increasingly likely that Stuttgart’s best case scenario would be staying in the relegation play-off position, and that tells you all you need to know.